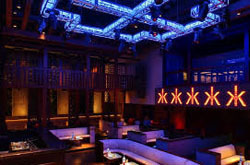 Hakkasan Nightclub at MGM Grand is Las Vegas' premier nightlife destination. The five-story venue houses the Ling Ling Club, a 10,000-square-foot experience and a separate, more intimate space known as the Ling Ling Lounge, which offers a more relaxed atmosphere with top-notch mixology. 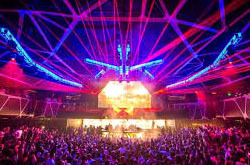 On the fourth level lies the main nightclub where oversized VIP booths surround the dance floor, offering a high-energy experience for table guests who wish to be at the center of the action. Adjacent to the main nightclub is the pavilion, a nightlife experience with an outdoor feel featuring an oriental garden, classic to its Chinoiserie design. The space operates as an extension of the main nightclub or individually. Equipped with its own DJ booth, the Garden Bar, an amphitheater-style setting, a visually stunning two-story water feature and lush life-like foliage completes what is certain to be Vegas' most unique and engaging destination. Elevated above the main nightclub is the mezzanine on the fifth level, which provides an area for guests who desire a more private, VIP environment while still having access to the energy of the dance floor. It can accommodate large groups in the semi-private rooms, featuring their own customizable screens, coolers, sound control and mixology supplies.